Say hello to Meadowbloom! 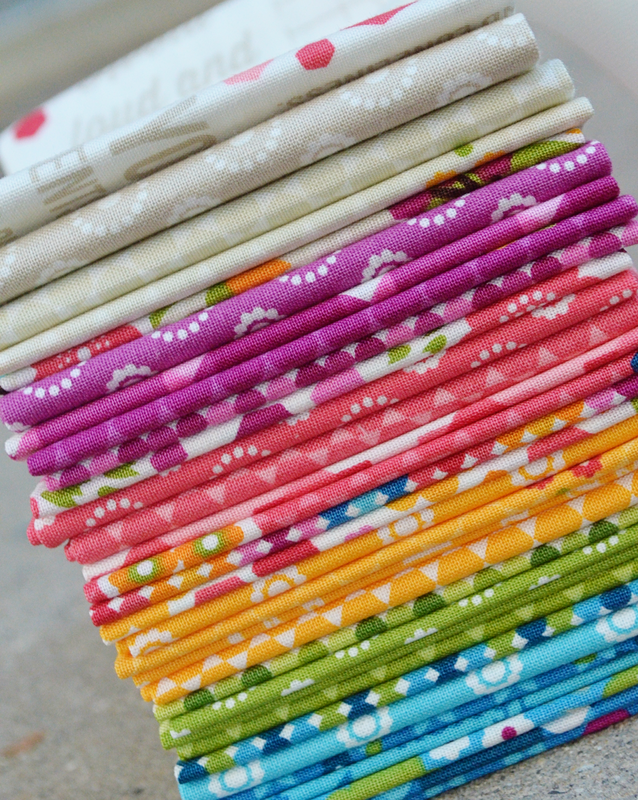 I designed this line to be happy, and springy, and all the beautiful vibrant colors that remind me of a huge field of wildflowers. I also included a text print of one of my favorite poems in the whole wide world–it’s even on a big chalkboard in my studio! Between the poem, and the wildflowers, I remembered an experience we had last summer as a family, and that became my “story” for Meadowbloom. Wanna hear? 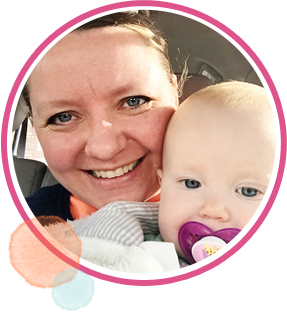 “Once, while driving through the canyon near our home in the Rocky Mountains, my family got a little antsy. We decided to pull the car off at the next available space and wander for a few moments. Those few moments were a breathtaking blessing, as we stumbled upon a wide open vista of panoramic views and beautiful blossoming wildflowers. 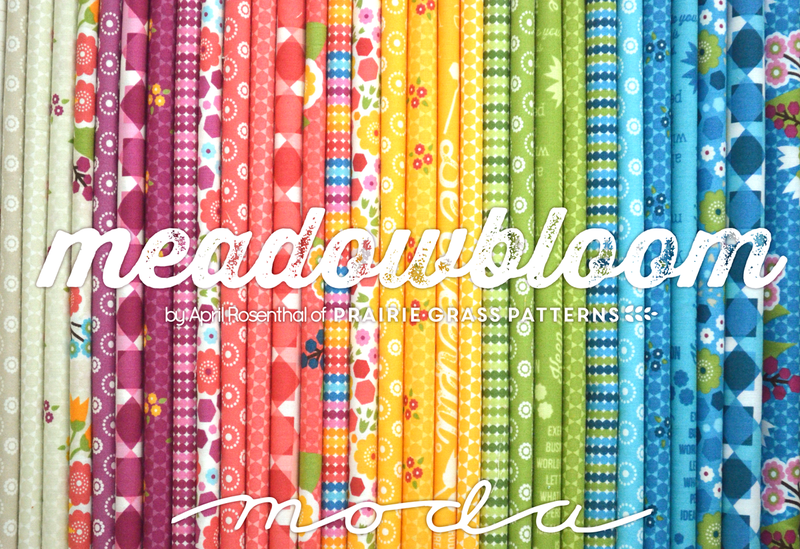 If you’re a shop owner, Meadowbloom is available now through your Moda rep–ask to see it! It ships in August, just in time for end of summer sewing! 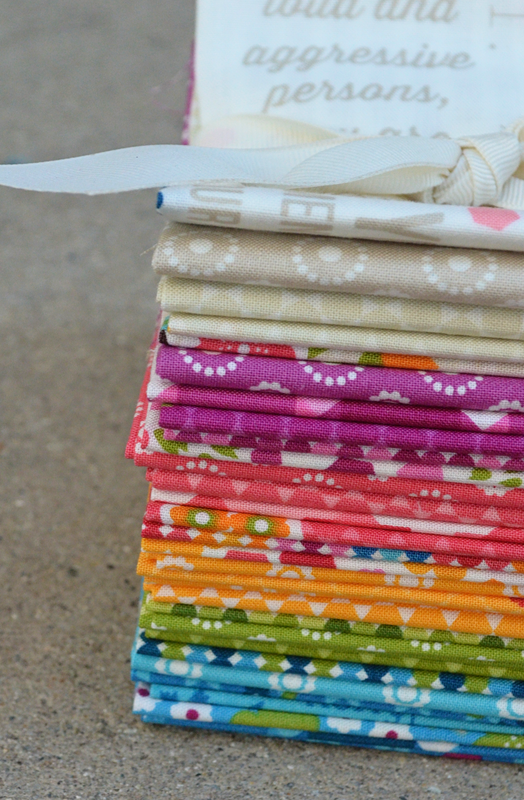 I’d love to know when you place your order so I can keep track of who has Meadowbloom in their shop–people ask me all the time where my fabric is carried–I’d LOVE to tell them to pay you a visit! Email me and let me know! 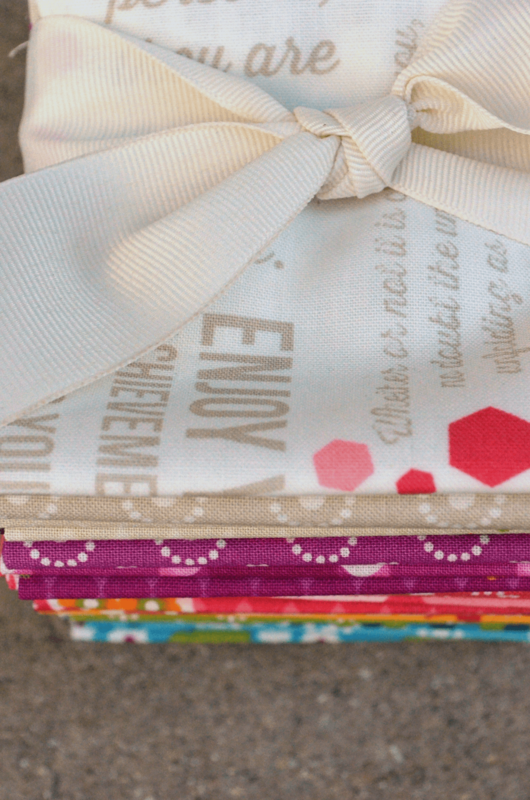 If you’re a fabric-a-holic and can’t wait to get your hands on this sweet little bundle, call or visit your local shop and ask to make sure they order it! Orders placed before the middle of May will be sure to get filled, so don’t miss out! I’ve been working on patterns to go along with Meadowbloom, and I can’t wait to start showing them off–just a bit more tweaking here and there…soon, soon! Firstly, I love it. The purple-ish is one of my favorite colors and you nailed it. Secondly, the universe is unfolding as it should. ;) Perfection. I WANT every single color and design. Absolutely beautiful. This is SO gorgeous! I love that you even included the most perfect low volume prints. I absolutely love this April!!! 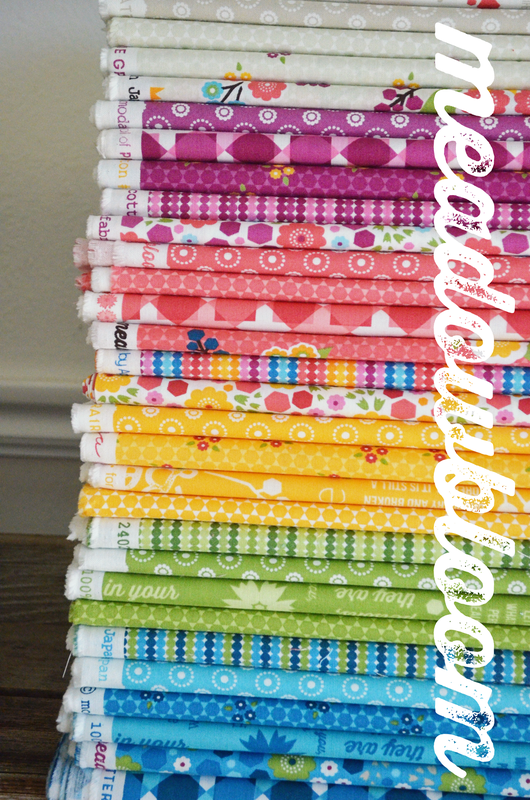 I love the bright colors and a text print too, yippee!!! I so enjoyed your story of the fabric. To often we forget to stop and enjoy the creations all around it. Just beautiful! Gorgeous fabric. Don’t think any of my local quilt shops are likely to order it given that I’m in Australia. Is it available online anywhere do you know? Mmm, those just are divine. Love them! Good work :) Love the story as well. 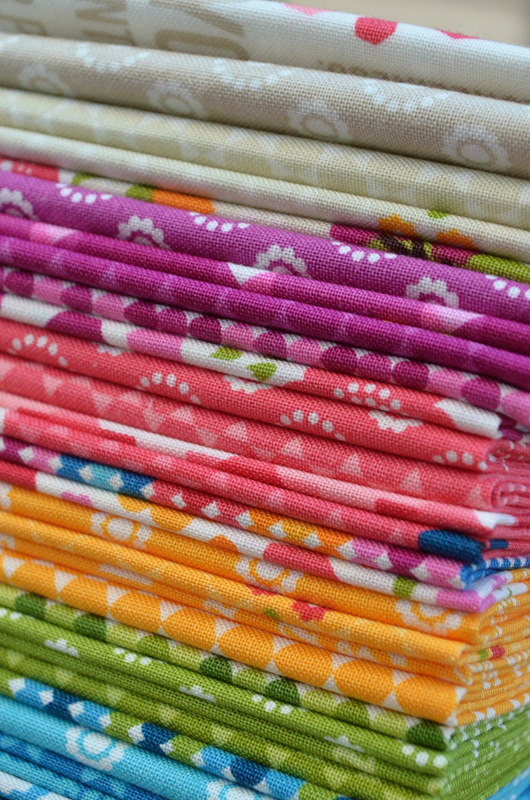 Lovely – bright and fresh fabric!!! Good job!!! I love the colors. I can truly see the meadow scene you wrote about in the color palette of your fabric. I will look for this fabric when it comes out in stores. Gorgeous fabric. And congratulations on your beautiful baby girl! Wow! This is a beautiful collection and the name you chose is perfect!!! !